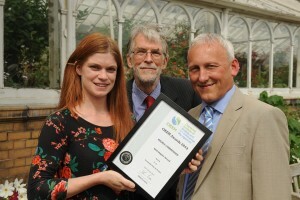 Today I attended the inaugural awards event of the Chartered Institute of Ecology and Environmental Management (CIEEM). The awards are not new but having a special event just for the awards was a first. It was inspiring stuff and the quality and range of finalists were hugely impressive. My particular interest was as the nominator for one of the finalists in the NGO Impact Category. I was backing Sustain for their Sustainable Fish City campaign. They got ‘Highly Commended’, losing out narrowly to an excellent RSPB-led project at Great Bells Farm in North Kent. Nonetheless this was great recognition for the Sustain team for their innovative and wide-reaching campaign. The Sustainable Fish City project began when a working group helped the organisers of the London 2012 Olympic and Paralympic Games to buy only sustainable fish. Inspired by this achievement, some of the Working Group members began to campaign to make sure all of the seafood served across London is demonstrably sustainable. In 2014, the campaign expanded beyond London, and it is now urging towns and cities across the UK to become Sustainable Fish Cities. As well as with cities, the campaign is having success in other areas too: recently being incorporated into the School Food Standards for all state-run schools in England. This a great example of a sustainability legacy from the London 2012 Games and I am delighted that the sustainable fish policies we developed are also being taken forward by the Glasgow 2014 Commonwealth Games and the Rio 2016 Olympic and Paralympic Games. To my mind that is a great example of reach and a very practical way of supporting marine conservation efforts.